If you’re lucky enough to end up with leftover turkey, here are 25+ Deliciously Healthy Recipes Using Leftover Turkey (or Chicken). Not every recipe here is low-carb, but there are some very tasty low-carb and gluten-free options if you’re getting back on track after the holiday! 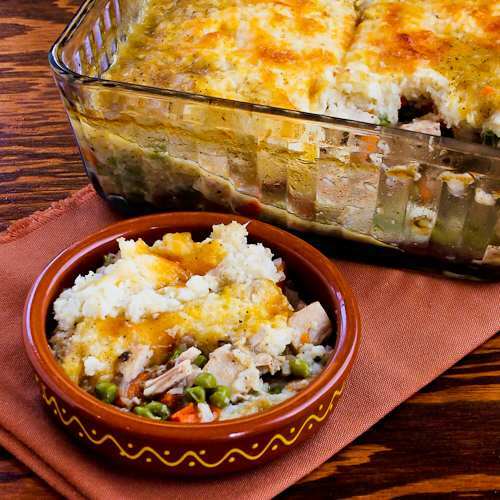 Click here to PIN this collection of recipe ideas for Leftover Turkey! It’s Thanksgiving Day and every one who celebrates Thanksgiving has probably been up for a few hours putting the turkey in the oven, right? I’m going to be taking a few days off to enjoy the holiday, but first I wanted to update this collection of Twenty-Five+ Deliciously Healthy Recipes Using Leftover Turkey (or Chicken). If you’re lucky enough to have some leftover turkey I hope you find something here that catches your eye for an idea to use it! I love, love, love Thanksgiving and the way it reminds us to be grateful for the blessings we have in our lives, and I hope all my readers have a wonderful Thanksgiving with plenty of leftover turkey! Now on to the 25+ healthy recipes for leftover turkey; enjoy!. Low-Carb Green Chile Quesadillas with Turkey and Cheese might be the perfect dish for Thanksgiving leftovers if you want something quick and easy! An after-Thanksgiving classic is this Leftover Turkey (or Chicken) Casserole with Brown Rice, Mushrooms, Sour Cream, Cheese, and Thyme and this recipe is usually a hit with everyone! 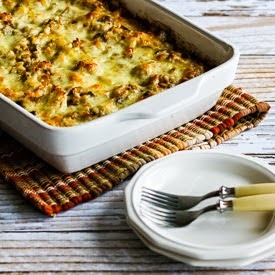 For a low-carb and gluten-free casserole with turkey, mushrooms, and cheese, we loved this Low-Carb Turkey Casserole with Mushrooms, Mozzarella, and Cauliflower Rice. If you want a grain-free and gluten-free recipe you can’t go wrong with this one. 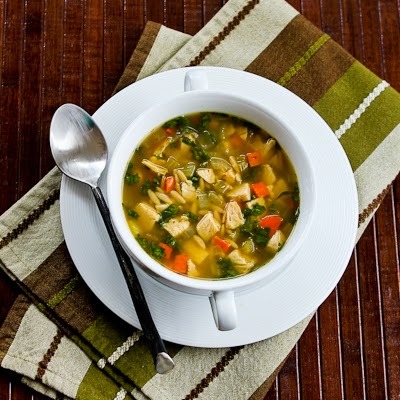 For a healthy soup with leftover turkey, try Slow Cooker Turkey (or Chicken) Soup with Kale and Sweet Potatoes. 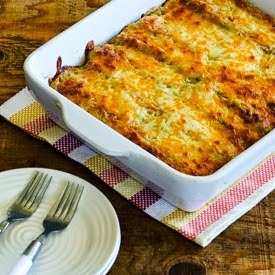 Another delicious low-carb option for leftover turkey (and a recipe that’s been wildly popular) is this Green Chile and Chicken Mock Enchilada Casserole. Just switch the chicken for turkey and enjoy! For a classic turkey soup without the carbs, this Low-Carb Turkey Soup with Zucchini Noodles is really amazing, and this is also gluten-free. This Cheesy Creamy Low-Carb Chicken Broccoli Curry Casserole would also be delicious made with leftover turkey and this is gluten-free! You can use turkey to make this Low-Carb Green Chile Chicken Enchilada Casserole; this recipe uses low-carb flour tortillas, and it’s pretty low in carbs for a dish like this. 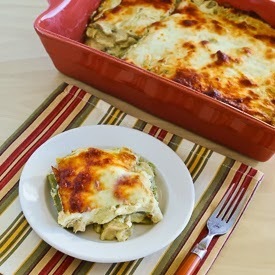 Turkey (or chicken) Lasagna with Sage and Three Cheeses has been a hit with everyone who’s tried it through the years. This could use new photos, but it’s definitely tasty. 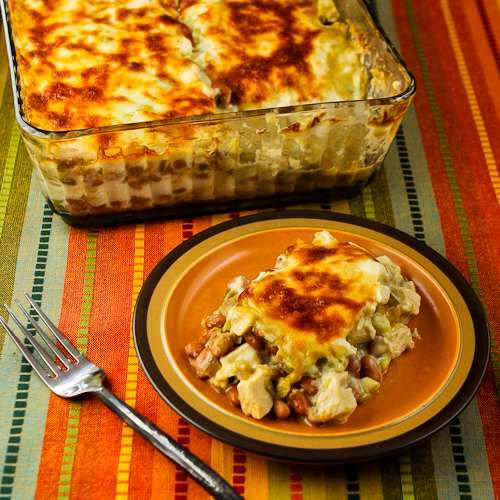 You can’t go wrong with Layered Mexican Casserole with Chicken (or turkey), Green Chiles, Pinto Beans, and Cheese. This has been a hit with everyone I’ve made it for! A recipe that’s already a big favorite is this Slow Cooker Lemony Turkey (or chicken) Soup with Spinach and Orzo. Try using cauliflower rice instead of orzo if you want a low-carb and gluten-free version. Low-Carb Slow Cooker Sour Cream Chicken Enchiladas can definitely be made with leftover turkey; I use low-carb tortillas for this. A slightly different take on sweet potatoes in soup is this Turkey and Cannellini Bean Soup with Sweet Potatoes and Rosemary. 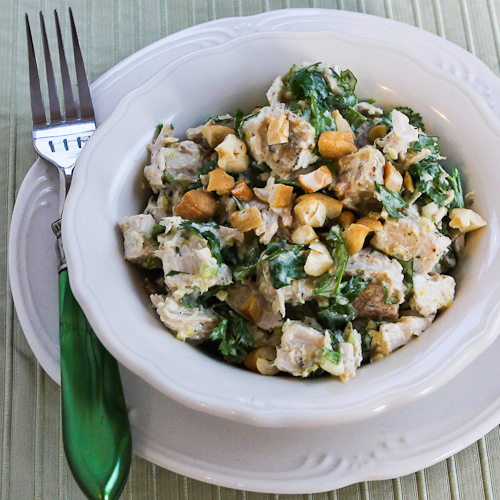 If you’re really wanting to get back on track after the holiday, this Leftover Turkey (or Chicken) Salad with Indian Spices, Lemon, and Cilantro was delicious and it’s a low-carb, Gluten-free, and South Beach Phase One salad. 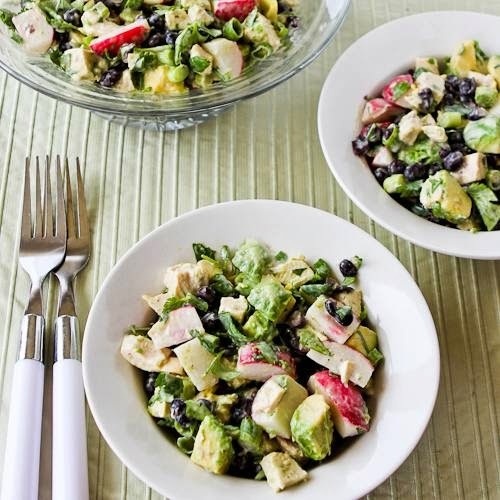 This Chicken and Avocado Salad with Lime and Cilantro that my sister Pam found on Pinterest has been hugely popular on the blog, and this would be delicious with leftover turkey. This is another option that’s low-carb, gluten-free, and South Beach phase One. Cabbage adds a healthy and slightly unusual twist in Turkey and Wild Rice Soup with Cabbage, Parsley, and Sage. 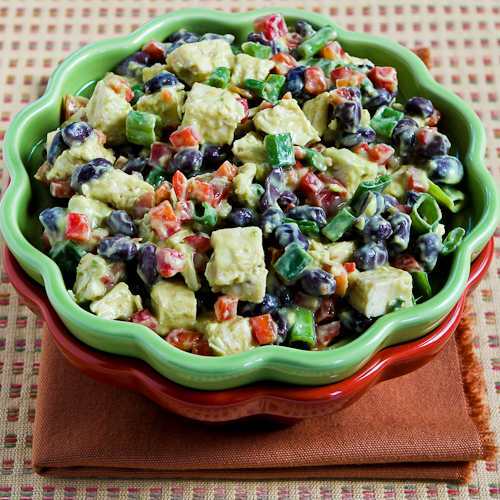 Another new chicken salad that I loved that would be perfect with leftover turkey is this Chicken, Black Bean, and Red Pepper Salad with Spicy Avocado Dressing. 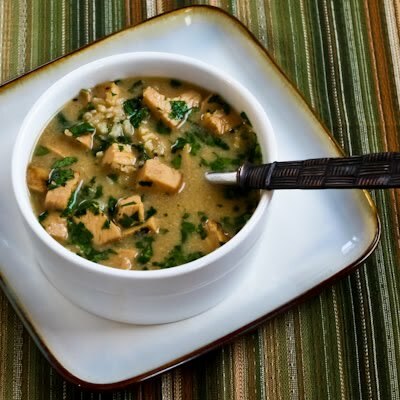 This Coconut-Lime Turkey (or Chicken) and Rice Soup is one of the most interesting recipes for turkey soup I’ve ever tried. 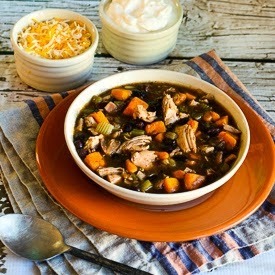 If you’re a fan of sweet potatoes, you’ll like this Leftover Turkey and Sweet Potato Soup with Black Beans and Lime. I love Brown Rice Salad with Leftover Turkey, Red Cabbage, and Pecans, and it’s loaded with healthful ingredients if you overindulge on the holiday. 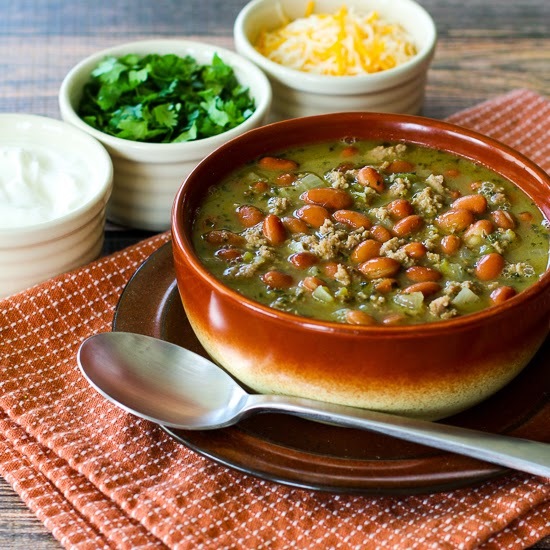 Amy’s Amazing White Chicken Chili is made with chicken breasts, but you could use white turkey meat to make this amazing chili as well. And that recipe just got updated with Instant Pot directions, so you can cook it on the stovetop or in the pressure cooker! 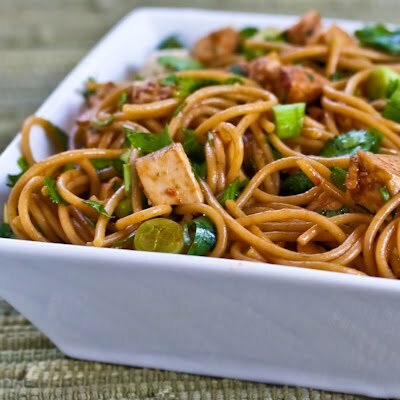 I would gobble up leftover turkey if it was used in this recipe of Spicy Whole Wheat Sesame Noodles with Chicken, Green Onions, and Cilantro. 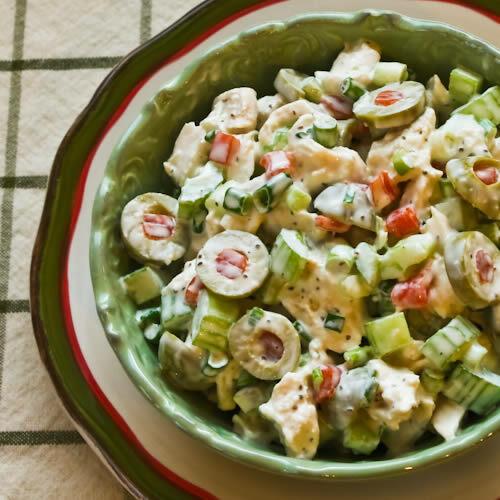 And for sure you could use leftover white turkey meat in this Shredded Chicken Salad with Green Olives, Celery, and Green Onion. Another casserole option that would work perfectly with leftover turkey is Better-than-Mom’s Chicken, Broccoli, and Quinoa Casserole with Creamy Curry Sauce. If you want something that’s phase one this Chicken, Black Bean, Avocado, and Radish Salad with Lime and Cilantro can definitely be made with leftover turkey. 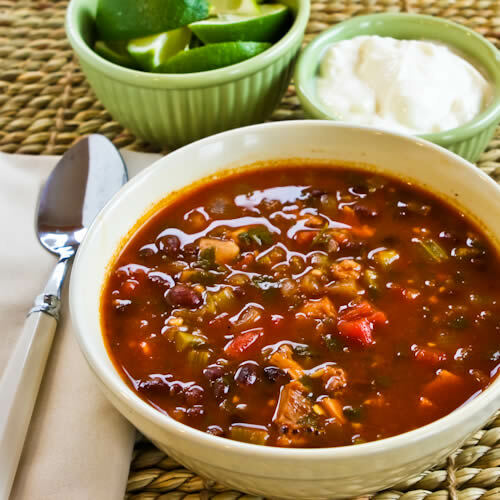 Chicken, Black Bean, and Cilantro Soup is one of my all-time favorites that could definitely be made with white turkey meat. 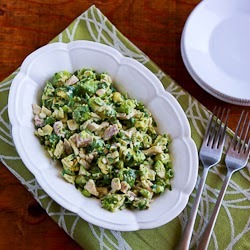 People from Utah might especially like this Leftover Chicken Chopped Salad with Cafe Rio Style Creamy Tomatillo Dressing, which of course can be made with leftover turkey! 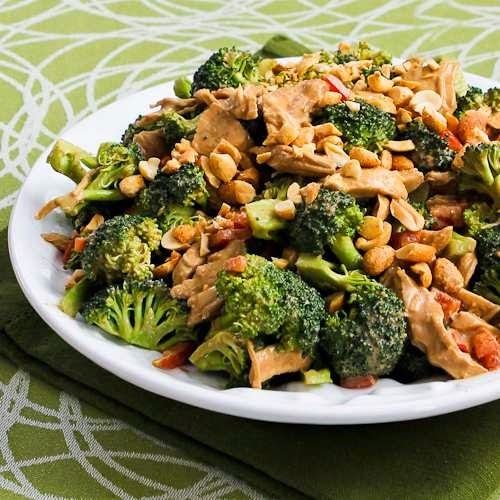 This Chicken, Broccoli, and Red Bell Pepper Salad with Peanut Butter Dressing can also be made with leftover turkey. And you could also use turkey in this West African Chicken and Peanut Stew with Chiles, Ginger, and Green Onions. 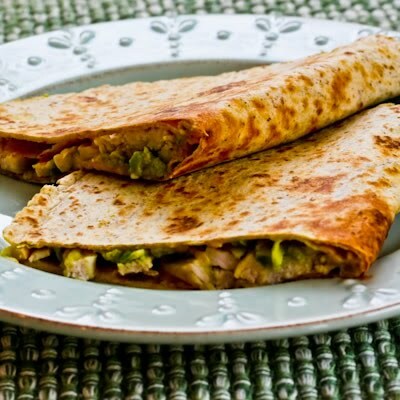 For a quick lunch made from turkey leftovers, try these Turkey and Guacamole Quesadillas. 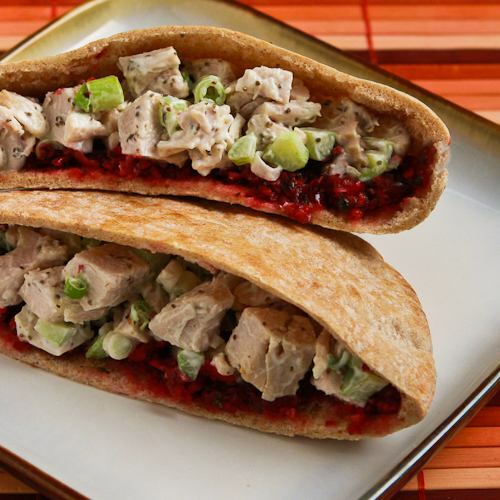 And last but not least, one thing I’ll for sure be making on Friday is these Easy Leftover Turkey Pita Sandwiches with Fresh Cranberry Salsa. That’s a lot of options for using leftover turkey, but there’s no such thing as too many leftover turkey recipes is there? If you’ve tried one of these recipes or you’ve got another good idea for using leftover turkey, let us know about it in the comments! Thanks Jeanette; hope you're having a great day! Lots of great ideas for leftovers from the big day. Happy Thanksgiving Kalyn! Erin, thanks so much. So glad you like the ideas! Some many great, healthy ideas. It would be nice to try a bite of each. Hope you had a really nice Thanksgiving Kalyn – lots of great ideas for leftovers! We simply layered all the leftovers in a casserole pan and reheated it. The boys love leftovers from Thanksgiving. Joe, so glad the recipes are helpful for you. Thank you so much for your Blog. We truly enjoy the recipes and find ourselves making adjustments based on our likes/dislikes. We have been SouthBeach dieters for 2 years and have found it important to find those likable alternatives. Thanks so much, go glad it has been good for you. Happy Thanksgiving! Enjoy your break, and enjoy all the great things of being with family and loved ones! It's been a joy to follow your blog through the years, you are a source of inspiration! This is a delicious round up. Now I'm seriously hungry. I made your Layered Mexican Casserole W/Chicken for dinner tonight. My family loved it! Thank you for sharing. Thanks Diane, and I'm going to update this post, so it may be 25 ideas using turkey by the time you next see it! Just wanted to let you know that your recipe has been included in a turkey roundup today. I will be pinning and tweeting it too. Happy Thanksgiving. Thankd Dara. I had a great Thanksgiving at my sister's house. Carrian, sadly, all my turkey is now gone. Jen, you're welcome. Hope you get to try some and enjoy them. Thanks so much for this list! I can't wait to try some of these recipes. The casseroles look delish and are gluten-free friendly 🙂 Yum! great ideas!! Heaven knows we have plenty to get rid of! Wow, what a fantastic list of recipes to use up that extra turkey. The Coconut-Lime Turkey & the sesame noodles have both caught my eye. I hope you had a wonderful day yesterday! Belated happy Thanksgiving, dear! Hope you are having a fabulous time with your family! Now I wish I had more turkey left over! Great round-up of low-glycemic post-Thanksgiving recipes. I'm going to start with the soups (predictable, aren't I?). Wow, thanks for so many ideas for my leftover turkey. 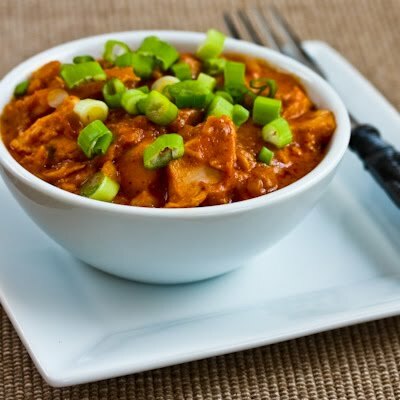 The West African Chicken and Peanut Stew looks amazing and I definitely will be trying that out. Happy Thanksgiving Kalyn. You have been an inspiration and roll model to so many. CA, sorry but I have never heard of that. But I do have a new feature on the blog that lets you save recipes to your own recipe box through Ziplist. You can access it on any site that's signed up with Ziplist, so the file can never get lost. T.W., thanks so much and best wishes for you on Thanksgiving and every day! Happy Thanksgiving, Kalyn! Blessings to you and your family! Hey Kalyn! I tracked your blog down through forums for the YUM recipe manager software. I'm wondering if you still have a working copy of it? I made the mistake of not exporting the right kind of file before upgrading and now I can't see any of my recipes. 🙁 I'm trying to track down anyone that would be willing to open my file and export it again in the right format. There are only about 50 recipes, so it's not a large file. If you can help, I'd be eternally grateful!